Learn how to turn your Nook color into a fully functioning Android powered tablet in our first ever First Friday class at Dayton Diode this Friday 3rd starting at 6:30. You may have seen the recent Wallstreet Journal article about turning the $200 device into a great tablet. 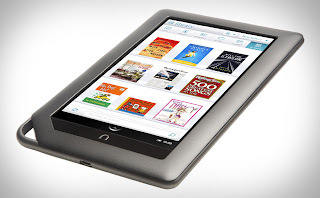 If you would like to learn more come join us and Shawn Garrett as he shows how he did the same thing with his own Nook Color. No Cost but Donations are always much appreciated! The class will be held at the Dayton Diode Space here are some Directions if you need them. Its going to be fun, talk all things Android as well. I've had a few request for video recording as well for those unable to attend tonight. Yes please; I've got to play volleyball tonight, but I'm very interested in learning about this. We have an attendee who has volunteered to record the presentation. Will post when we have the video up. I played around with a nightly build of CM7 today and got bluetooth able to pair with a few devices... wouldn't stay connected though. Developers still working out the bugs. The finished video is just over 55 minutes long. I've rendered it as a 720x400 MP4 and a 720x400 DivX AVI version as well as a 512x288 MP4, but the lower resolution version is nearly unreadable. The 720x400 MP4 is 267MB and the AVI is 727MB. The smaller MP4 is 170MB. I can render it at full 1920x1080 if anyone wants it, either as a file or as a Blu-ray disc. I'll also render it on DVD. Now all I need is a place to put it. My YouTube account, as are most, is limited to 15 minute or shorter videos. I could split it into four segments of less than 15 minutes each, but I'm not too keen on the idea. I'm hosting them temporarily at http://www.dma.org/~lundyd/Hack-A-Nook.shtml I'm currently uploading the 720x400 MP4 & DivX AVI versions. I'm currently rendering an iPod compatible version at 640x360. 10 Great Android Apps that require Root, my favorite as of this morning... REMOVE ADVERTS FROM EVERYTHING!!! I've burned 2 DVDs. I gave one to Ken Phelps tonight at the DMA meeting and I'm hoping to see J. tomorrow at lunch to give him the other one. Interesting article in the economist about hacking tablets and phones.